FREE Starter sessions: An introduction session for an opportunity to try out the different Cycles and find the right one for you; learn how to start, control and stop safely. 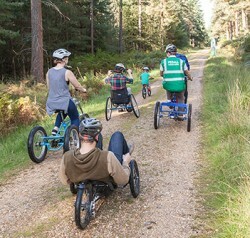 Guided rides: Led rides that take place on the off-road cycle network which is made up of wide gravel tracks that pass through the woodlands and heathlands of the New Forest. Guided rides cost £5 per person including 1 carer/parent or £10 per family of up to 5 people. Sessions usually last between one and two hours; this includes kitting up, selecting bikes and regular breaks. Distances are tailored to suit the ability of the riders. You are required to attend a starter session before coming on a guided ride. Booking is essential as we need to make sure that we have enough bikes and staff. To book onto a session click on the date above and select the “View and book” button. For group bookings or other requests please get in touch using the form below. All our sessions are delivered by qualified leaders and supported by assistants. We encourage family members and friends to join in. Riders under 18 or needing additional support must be accompanied by a responsible adult.